Aung San Suu Kyi has been the voice of Myanmar’s democracy for the past 20 years and was awarded the Nobel Peace Prize in 1991. She was held under house arrest by Myanmar’s ruling military for a total of 21 years, and was released on 13 November 2010. Since her release, she has been visited by then U.S. Secretary of State Hillary Clinton and British Foreign Minister William Hague. In November 2015, as leader of the National League for Democracy, Aung San Suu Kyi led her party to victory in the General Election in Myanmar. 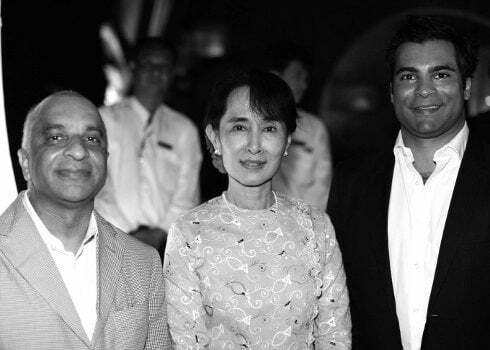 In late 2011, Rumi Verjee and Jay Verjee travelled to Myanmar on an education and fact-finding mission with a group of global business leaders and met with Aung San Suu Kyi. Her work and passion are admirable, and the Foundation continues to look for ways to support important and inspirational change-makers in the world.